CRYSTAL LAKE, Ill.--(BUSINESS WIRE)--Jan. 18, 2019-- AptarGroup, Inc. (NYSE: ATR) announced today that it has signed the New Plastics Economy Global Commitment and has joined forces with other businesses and governments committed to changing how we produce, use and reuse plastic. The Global Commitment, through the Ellen MacArthur Foundation, has mobilized over 250 signatories that are determined to start building a circular economy for plastic. 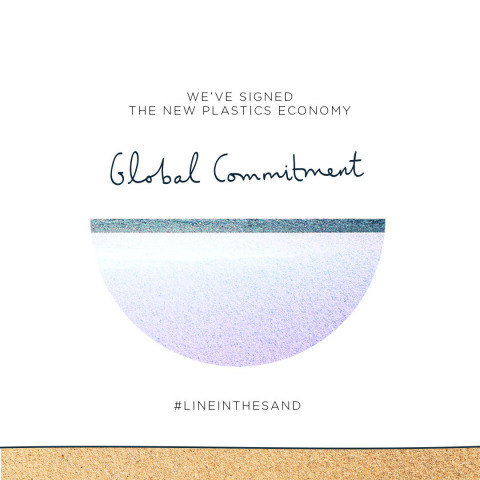 Signatories of the Global Commitment include companies representing 20% of all plastic produced globally. Together they will work to eliminate plastic items that are not needed; innovate so that needed plastic is designed to be safely reused, recycled or composited; and circulate used plastic to keep it in the economy and out of the environment. In the interest of supporting a more sustainable economy, Aptar launched a Sustainable Materials Task Force to address customer, consumer and regulatory expectations for sustainable product offerings. The task force’s fundamental objectives were to create a reliable network of sustainable material suppliers with the necessary technical and supply capabilities, and to establish a robust process with suppliers to validate sustainable materials and offer ready-to-use solutions. Over the past few years, Aptar has evaluated and tested a number of sustainable resins. Aptar seeks sustainable materials that can replace our standard fossil-based resins, and is currently investigating post-consumer recycled resins (PCR), post-industrial resins (PIR) and bio-based materials. Aptar has launched stock tube-top, snap-top and disc-top closures in North America made with PCR resin. Approved by the U.S. Food and Drug Administration (FDA) for use in the beauty, personal care and home care applications, this PCR polypropylene is blended 50/50 with virgin polypropylene resin. Aptar also recently qualified some of its dispensing systems with actuator, closure and dip tube components made of bio-based materials. These were the first dispensing systems on the global market to complete a life cycle assessment (LCA) and achieve an environmental product declaration (EPD) in compliance with standard ISO 14025. With the recent certification of LCA studies, these dispensing systems can further reduce environmental impact. Aptar remains committed to sustainable resins and will continue to seek opportunities to replace fossil-based resins and increase our offering of sustainable dispensing solutions. We invite you to read more about our sustainability efforts in our 2017 Corporate Sustainability Report. This press release contains forward-looking statements. Words such as “future” and other similar expressions or future or conditional verbs such as “will” are intended to identify such forward-looking statements. Forward-looking statements are made pursuant to the safe harbor provisions of Section 27A of the Securities Act of 1933 and Section 21E of the Securities Exchange Act of 1934 and are based on our beliefs as well as assumptions made by and information currently available to us. Accordingly, our actual results may differ materially from those expressed or implied in such forward-looking statements due to known or unknown risks and uncertainties that exist in our operations and business environment. Additionally, forward-looking statements include statements that do not relate solely to historical facts, such as statements which identify uncertainties or trends, discuss the possible future effects of current known trends or uncertainties or which indicate that the future effects of known trends or uncertainties cannot be predicted, guaranteed or assured. For additional information on these and other risks and uncertainties, please see our filings with the Securities and Exchange Commission, including the discussion under “Risk Factors” and “Management’s Discussion and Analysis of Financial Condition and Results of Operations” in our Form 10-Ks and Form 10-Qs. We undertake no obligation to update any forward-looking statements, whether as a result of new information, future events or otherwise.